At the end of August I went to the Edinburgh Book Festival to see a joint talk by two authors – Dan Boothby and Gareth Williams. Dan Boothby was talking about his new book, ‘Island of Dreams’, while Gareth Williams gave a presentation about his release of ‘A Monstrous Commotion’, which focuses on his research into the mystery of the Loch Ness Monster. I can highly recommend both books, but in this feature I’m going to review the first one, ‘Island of Dreams’, which I have enjoyed reading over the last few weeks. Like thousands of people, in my childhood I can remember reading the books of Gavin Maxwell – in particular ‘Ring of Bright Water’ and ‘The Rocks Remain’. Maxwell entertained generations of children with his stories, but they carry undercurrents of tragedy that only become fully apparent when you are older. One of Maxwell’s young readers was Dan Boothby. Aged 15, he picked up a copy of ‘Raven Seek Thy Brother’ and was irresistibly drawn into Maxwell’s world, consuming all his other books and then, over a period of years, researching his life and visiting the places connected with him. His pilgrimages to Scotland resulted, eventually, in his move to one of Maxwell’s former homes, and his book, ‘Island of Dreams’, is the story of his time there. Gavin Maxwell was a naturalist and author born into a titled Dumfriesshire family. During the Second World War he served as an instructor with Special Operations and in the 1950s he travelled around the marshes of Iraq with explorer Wilfred Thesiger. It was Thesiger who gave him his first otter, Mijbil. 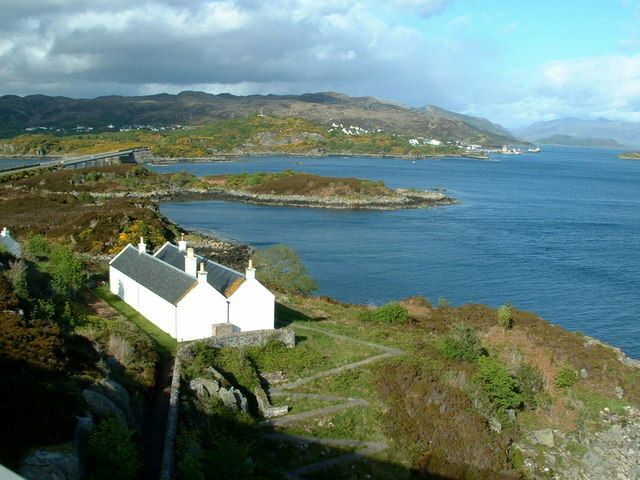 Maxwell made a home on the west coast of Scotland, at a place called Sandaig, near Glenelg; in his books, he named it ‘Camusfeàrna’, the ‘bay of alders’. It was remote, romantic, wildly idyllic; but Maxwell was a haunted soul, and his relationships were stormy and passionate. His life was visited by tragedy: Mijbil was killed in a heartbreaking ‘accident’, and soon afterwards another otter, Edal, lost her life when the house was razed by fire. Maxwell then moved to the lighthouse island of Eilean Bàn in the Kyle of Lochalsh, which was his home until he died of cancer in 1969. In 1985 Dan Boothby travelled to Sandaig for the first time. He camped there for a week, exploring the beach, catching and cooking crabs, enduring the rain and the midges, and bathing in the burn that tumbles down the hillside to the sea. Maxwell used to sit by those falls to do much of his writing, and he once remarked that his soul would return there when he died. Dan remembers Sandaig as a haunted place, and says he felt like a trespasser. Sandaig he left to the silence of its ghosts; but twenty years later, as a new tenant and caretaker, he was pushing open the door into the damp, musty air of Maxwell’s second home, on Eilean Bàn. Staying in the Lighthouse Keeper’s cottage, Dan’s task was to gradually restore the garden and tidy up the house, which in many ways felt as if Maxwell had never left. He drank in the views, the wildlife and the memories, watching the tides and the seasons come and go. During the summer he escorted groups of visitors around the island, and he made friends with local characters, some of whom remembered Maxwell. When he describes his first sighting of an otter, you almost hold your breath alongside him. ‘Island of Dreams’ sounds like a place of eternal bliss, a paradise fulfilled, suggesting a coming home, a kind of resolution, a ‘happy ever after’. But it is none of these. Dan’s writing is shot through with wistfulness, as if he is searching for something that is not there, a soul trapped on the other side of time’s window. For most of his life he had experienced a “preposterous nostalgia for a way of life I’d never known”, and he had to immerse himself in it completely before he could let it go. Although he never met Maxwell, I believe that he probably knows him better than many who actually did. Maxwell was an enigma, seeking attention and friendship but hopelessly unable to deal with either; his homosexuality drove him to despair, because he lived in an era which did not tolerate it. Everything he loved was destroyed, or would destroy him. I can see why Dan couldn’t live his dream, or part of it, for very long. ‘Island of Dreams‘ could easily have been dark and oppressive, but in fact it is insightful, poignant and entertaining; something in the tone, in fact, reminds me of Maxwell himself. Dan is a natural writer, telling his story with sensitivity and self-deprecating humour, weaving the present with the past so that many worlds seem to exist at once. He is honest and confiding, as if he is very aware of his own soul. A wonderfully reflective and enjoyable piece of writing. I was sorry to finish it. 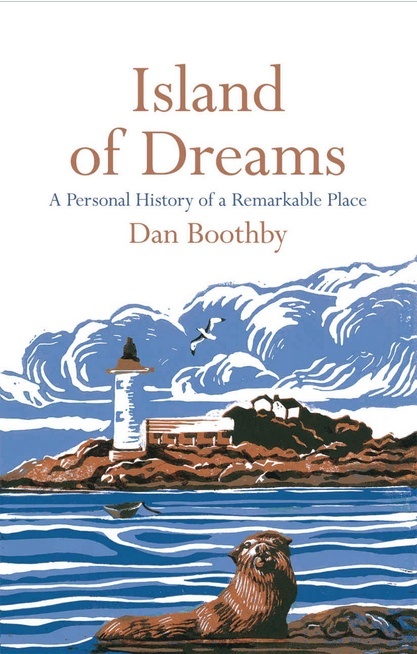 ‘Island of Dreams – A Personal History of a Remarkable Place’ by Dan Boothby is published in paperback by Picador, priced at £8.99. Dan was kind enough to answer some of my questions about ‘Island of Dreams’. 1. Have you written anything before – any books – have you always felt that you were a writer? Are you compelled to write? A friend of mine said the other day he thought writing (for writers) is a kind of OCD – something we are compelled to do. I was thinking about this the other month and decided that I write to tell MYSELF stories – to make it all better. Life is messy and straggly and so maybe I write to impose some order on it… For many of my younger years I kept journals of my wanderings. For about four years in my thirties I wrote, researched, updated and edited books for a now defunct publisher of guidebooks. A very boring job of hackwork. I always wanted to be a writer; the life seemed ideal. It can be. 2. Why do you feel that you were drawn back again and again to Maxwell’s books? I remember you said that it was ‘Raven Seek Thy Brother’ that struck you most. 3. Do you feel that Maxwell could have foreseen or avoided the sad chain of events that led to the loss of Mij, Edal, the house and ultimately his death? Do you think that in some ways he brought it upon himself? (Not looking to blame anyone but just interested in how we affect our own fate). I like the notion ‘What’s for you, won’t go by you’. If you live on the run, or live the freelance life of an artist, or don’t pay enough attention to the details – life will bite you hard and often on the bum. Life bites us all on the bum anyway, but running away never helps anything. Maxwell always seemed to be running away. Also, teenagers rarely make diligent employees, however well-meaning and hard-working and biddable they may be. 4. If you’d had the opportunity of meeting Maxwell, is there any particular thing you would have said to him? I’d liked to have met him, bought him a drink. I hear that he could be very witty and good fun when he was on form. He was obviously a very bright, well-travelled man. Interesting company. Not sure what he’d have made of me. I’m not high-born enough for him to have considered me an equal. 5. Has something been resolved inside yourself, from living on the island and from writing the book? Has it shifted your understanding and/or affiliation for Maxwell? Is it too early to say? 6. Are you comfortable with talking about the book – or do you feel slightly exposed, having written it? I’ve enjoyed talking about the book. When I lived on the island I took visitors on tours around the place – up the lighthouse and across to the hide and into the Long Room (Maxwell museum). To begin with I didn’t know all the history, and so I worried that I’d look foolish and ignorant, but once I knew everything (all right not everything, but quite a lot) I had no need to worry about what people might ask me. The island had become ‘my turf’. It was just good to have people to share my enthusiasm with about the place and its history. I feel the same when I speak about the book. I know all about it and so enjoy talking about it. I think most people enjoy sharing information about things they know. 7. What is happening now with the island and the lighthouse cottage? The Eilean Bàn Trust, which looks after the island, still uses volunteers to help maintain the place and to conduct the guided tours over the tourist April-September season. Volunteers are always needed. The main part of the cottage is let to visitors (www.eileanban.org) throughout the year as a holiday let, which brings in some income, as do sales, etc from the Bright Water Visitors’ Centre in Kyleakin. My grateful thanks to Dan for taking the time to answer my questions. What a fascinating story…It seems to convey a dual purpose…exploring Maxwell’s life, and through that journey, engaging with Boothby’s own impulses in life as a writer. Although not familiar with Mr. Maxwell’s work (which I hope to remedy), I can relate to being drawn to experience a landscape and way of life that seems ever more unreachable…Your interview with Dan Boothby was insightful and pertinent…His comments on some of the things that led him to follow his obsession with Maxwell were especially of interest. Thanks for sharing your discovery of this book…Shall look forward to reading it and some of Maxwell’s work. It is a fascinating story, Jo, and an engaging one – there’s such a sense of longing which never resolves into belonging. Even when he’s talking about other things you can ‘hear’ it in the background. Dan has an observant eye and his character sketches are excellent. His insights into Maxwell’s life are also very interesting, and I learned a lot that I didn’t know. I hope you’ll enjoy reading it as much as I did. I think so, David – it’s more than a biographical memoir, and Dan’s writing is a lovely echo in many ways to Maxwell’s own. I found it difficult to put down, which is always a nice feeling with a new book! Thank you for the great review. I had recently been on a Gavin Maxwell reading jag (books by and about him) so it is perfect timing to find yet another book to fill in more of the story. Thanks again, Jo!! Excellent! Great timing! I am sure you’ll enjoy this, and it will give another perspective. As mentioned above, for anyone who would like to know more about Gavin Maxwell, his books, or books written by other people who knew him well, there is now a Facebook Group “The Gavin Maxwell Society.” New Members welcome! I am here now on Skye volunteering in the Brightwater Centre for June. Living on Eilean Ban in the bedsit. I love it here and have discovered that Dan has written the book. We have just sold the last copy in the centre so I will order some more. However I think one of the cottage guests said he had bought a copy and will lend it to me. I am very keen to read it. How lovely, Gillian! I hope you have a great time there. I’m sure you’ll enjoy the book – I couldn’t put it down! The perfect place to read it as well!